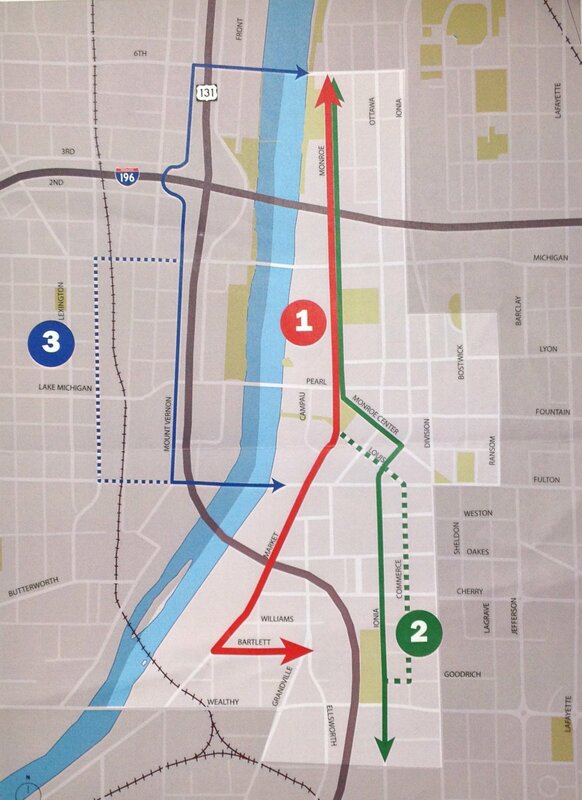 Two possible streetcar routes in Grand Rapids: Which is best? A group that’s restarting talk about an electric streetcar line in Grand Rapids is fine-tuning the concept and is weighing whether routes should already run where people already are or where the city is developing. The role pits the streetcars as a catalyst for new investment with being a connector between what already exists, but leaders believe there’s room to fill each objective. “We have to go where the people are now, but we have to look to the future, too,” said the Rev. Mark Przybysz, a Catholic priest who’s part of a committee refining a 2008 streetcar study. Initially, however, Grand Rapids may have to choose just one emphasis. A streetcar line will cost tens of millions of dollars and consultants advise settling on the shortest route that can attract federal funding and at the same time meet the community’s goals. Monroe Avenue NW from Sixth Street to Fulton Street, where the road turns into Market Avenue SW. The street car route would continue south of Fulton to Bartlett Street, then turn east to Rapid Central Station. Monroe Avenue NW from Sixth Street to Monroe Center, then southeast on Monroe Center to Ionia Avenue where the route would head south on Ionia to the Downtown Market at Logan Street SW.
There’s also some desire to have a route on the west side of the Grand River, on Mount Vernon and Turner avenues between Sixth and Fulton streets. Committee members were divided at a meeting earlier this week. Consultants plan next month to give the committee a closer look at various land uses along the proposed routes. 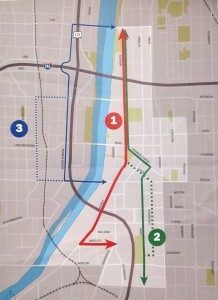 The Monroe-Market route was identified in a 2008 study. Advocates of a streetcar line think that route might spur new development along the river. But most downtown visitors would prefer a streetcar route down Ionia, said George Aquino, vice president and managing director of the Amway Hotel Collection. “You’re going to have too many naysayers (on the Market route) saying ‘Why do you want to go here when we really want to go here (to Ionia)?’” he said. The committee also is looking into funding prospects, which could include a mix of local, federal and private sources. Consultants said streetcar lines elsewhere are often funded partially with federal grants, with local sources including assessments on properties within a few blocks of the line, sales tax within a certain area and parking surcharges.